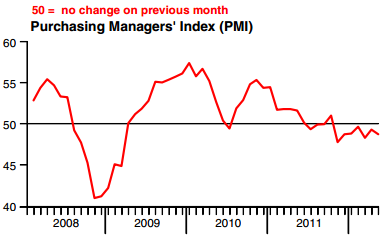 Further signs of economic slowdown in China have shown up in the HSBC China PMI index. WSJ: - The preliminary May reading marks the seventh straight month the index has been in contractionary territory. A reading below 50 indicates contraction from the previous month, while anything above that indicates growth. "China's real economy is getting weaker," Citi Investment economist Ding Shuang said following the release of the PMI. "The likelihood that May industrial production and fixed-assets investment, two major gauges of economic activity, will improve is slight. The data are likely to stay weak," he added. Ding expects growth in China's gross domestic product to slow to 7.5% in the second quarter from a year earlier, slowing from the first quarter's 8.1% expansion, which was the weakest in more than three years. To address this slowdown, we've already seen China accelerating infrastructure projects approvals. Reuters: - ... the government had asked for project proposals by the end of June, even for those initially earmarked for the end of the year, said the China Securities Journal, one of the country's top financial papers. Citing government sources, the article said Beijing did not rule out bringing forward next year's projects, if it thought more investments would be needed to stimulate the economy. But now the Chinese authorities have also allowed the Renminbi to weaken. 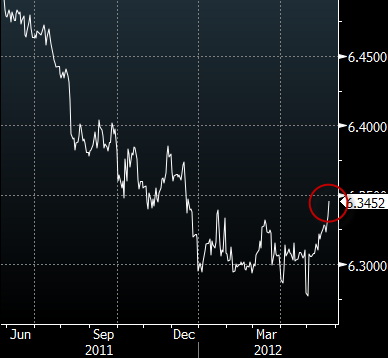 Feeling confident about their ability to control inflation, PBoC is viewing currency weakness as a form of stimulus. It certainly makes sense for a nation addicted to exports (weaker currency will make China's exports more competitive). It's unclear how US politicians will react to this move. While the Obama administration remains tempered on this issue, this move will likely add fuel to Mitt Romney's goal to brand China a "currency manipulator". This is sure to become a point of debate in the US later this year.